The following is a detailed game guide, covering all aspects of the game. It is recommended to read through this guide before playing Airline Enterprise to gain a better understanding of how the game works. 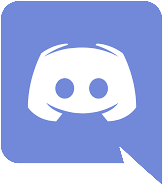 If you have any questions that this guide doesn't answer, feel free to create an account on our Forums and we'll be happy to help! If you are looking for something specific in this guide, you can push CTRL+F (or COMMAND+F on Mac) to search for a particular term. Your account can be accessed by clicking on About --> My Account in the main menu. Usernames in Airline Enterprise can not be changed. To change your password, click the Change Password link on the account page. You will be promted to enter your current password, as well as the new password you would like. To change your date and time settings, select your time zone from the list provided, and make sure the daylight savings setting is correct for your time zone. Time zone setup is necessary to ensure times are displayed to you correctly throughout the game, for example flight departure and arrival times. The current time on your account should match the current time where you live. If you want to reset your airline and start over, click the red Reset Airline link at the bottom of your account. This will delete your airline and prompt you to create a new one. This action is irreversible, so be certain that you want to start over before you reset your airline. You may only reset your airline once every two weeks. Your Airline Overview page displays a general analysis of your airline. The top table lists basic airline information such as your Headquarters location, reputation, credit rating, passengers carried and 24 hour revenue. The second table shows active flights that are landing soon. To view all active and scheduled flights, click the see all link on the top of the table. The third and fourth tables list your gates and your aircraft, respectively. Not all gates are displayed here. Click the view all link to go to the gate management page. The fleet table displays each aircraft model you operate, the number you own or lease, as well as the average age of that model group. Each flight you operate has a reputation for each class of service on the flight. This class reputation is what is used to calculate demand on the flight (not your airline image). This allows for more accurate allocation of demand depending on what your quality of service is for each class - you could have fantastic business class service but lackluster economy class service, which will be reflected in your reputation for each class. Keep in mind the prices you charge passengers to use IFE or IFS do not affect your reputation at this time - it only affects the number of passengers that will choose to pay for your service. To calculate the class reputation for a particular flight, the game compares the quality of your IFE and IFS configurations to the expectations of the passengers. Passenger expectations increase as flight time increases. IFE and IFS both make up 50% of the reputation for each class. As long as your flight's class reputation meets the passenger expectations for that class, and for that flight time, you will get 100% rep in that class for that flight. A 3 hour flight will not have an expectation of 100%, even for first class. The exact expectations are not published information, but generally, the longer the flight, and the higher the class, the higher the expectations. Bottom line, to increase your class reputation, you need to offer better service to your passengers through better cabin configurations and entertainment options, and better in-flight service options. The lower your reputation in any particular class, the lower your ticket price will have to be in order to attract passengers to fly with your airline. If your reputation is higher, you can charge higher prices without losing as much demand. Your airline image is a representation of how your airline is viewed by the public, similar to a skytrax rating. A good image represents a well-known and trusted airline with good service. Airline Image is calculated once per day and is an average of your total flight reputation from the previous week. Each flight you operate is assigned it's own individual reputation. Offering better service and more classes of service will improve your total flight reputation, and thus, your airline image. In the future airline image will consider more than just total flight reputation, but for now, that's all it considers. Below are the loan credit limits and interest rates as well as the aircraft lease limits for each rating. Loan and lease limits are monetary values as opposed to hard limits. For example with an A- credit rating you are entitled to $200,000,000 in loans at a 4.5% APR as well as $35,000,000 in monthly aircraft leases. Credit rating is still a work in progress. You have several ways to view and track your airline's financial performance. Ledgers provide a detailed look into your transactions, one by one. The income statement breaks down expenses and revenues into categories, and displays a monthly balance. The flight history page displays a log of all your flights, along with detailed information such as fuel cost, revenue, profit, number of passengers and so on. All of these are explained in detail below, and can be accessed by going to Manage Airline --> Financial on the main menu. The ledger is broken down into two sections: recent transactions and upcoming transactions. Recent transactions lists all of the financial transactions that your airline has already incurred. Upcoming transactions lists transactions that you have not been charged for yet, but you will be eventually. Any and all financial transactions are recorded in the ledgers, from flight revenue and fuel costs, to aircraft maintenance and landing fees, and everything in between. If you pay for it or get paid for it, it will show up in the ledgers. Only the 20 most recent (or the next 20 upcoming) are displayed on the main page, but you can view all transactions by clicking the (see all) link. The income statement provides a monthly overview of your categorized income and expenses. Income and expenses are broken down into operating and non-operating, which are used to determine your operating income as well as your profit margin. Operating income is considered to be a reliable indicator of the financial health of your airline, as it disregards capital investments such as aircraft purchases and one-off expenses that would otherwise give a false indication of performance. The income statement is a good way to see the overall long-term financial performance of your airline, as well as see what categories you are spending the most money in. The loan management page allows you to view the current balance of any loans you have, and pay them off. You can also view any past loans that have been closed, as well as request a new loan if your credit rating allows it. Interest charged on loans is the APR, or Annual Percentage Rate, and is compounded daily. To get the daily interest rate, divide the APR by 365. Then multiply that by the amount owed to get the daily interest charge. Loans do have a minimum daily payment of 2x the interest. The number of loans you can have, as well as your credit limit (maximum amount you can loan) and your interest rate depends on your airline's credit rating. To view the loan options at each credit rating, see Credit Rating. The Flight History page provides a list of all flights that have flown for your airline since you founded it. It shows you multiple pieces of information you can use to analyze your airline’s financial performance in the past. If you click on a flight number, you will be taken to the detail page for that flight, which will show additional information on the flight, such as the number of passengers in each class, and the fares they paid. The reputation column shows the percentage points that the flight affected your reputation, please see the reputation section for more details. Employees are required for your airline to run smoothly and efficiently. You can set your own pay, and percent of extra employees, but keep in mind that employees can leave, and if they do, you will have to pay extra to hire new employees. The attrition rate column shows the percentage of employees that are leaving every month. Employee pay affects happiness, which in turn affects attrition rate. You can pay your employees as much or as little as you like, the minimum wage in-game is $7 per hour. The total cost for each employee group is the number of employees hired multiplied by their hourly pay multiplied by the number of hours each week they work (you cannot change this aspect), with attrition costs factored in. You can see your total employee pay at the bottom of the page. Your infrastructure is the buildings that you own or lease. Currently, you can only lease your headquarters building, and other infrastructure options are not yet implemented, but will be in the future. The capacity of your building is the number of people who can comfortably work in it. The number of people who work in your building is the number of Executives and Corporate Operations personnel you have hired. A portion of your Customer Service Agents also work in your building. If the number of people in your building goes over the capacity, employee happiness will fall, and attrition rate among your employees increases. Upgrading your building is simple, click on the manage button on the right side of the infrastructure screen. From there you can see upgrade and lease costs for larger buildings. Marketing is essential to the success of your airline. Not having an active marketing campaign will severly limit the public awareness of your airline and negatively affect your airline image. Each marketing medium has it's own effectiveness and cost. You should choose the medium(s) that align with the size of your airline and your marketing budget. More effective marketing mediums require a higher investment to achieve the maximum results. Less effective marketing mediums could be more effective than their highly effective counterparts if your budget allows it - it's not a simple game of "higher effective mediums are always better". Your marketing ROI truly depends on your budget and what you are willing to spend. Additionally, marketing campaigns must be purchased in "blocks" - i.e. each medium has a minimum spend amount, and "steps" that you must take if you wish to move up the chain in that medium. This is due to the nature of marketing - for example you cannot purchase 1.5 television commercials - you must purchase either 1, or 2. The same goes for every medium. The Purchase Aircraft page allows you to purchase new aircraft directly from a manufacturer. The first step is to select the manufacturer you would like to order aircraft from. Once you have selected a manufacturer, you’ll be able to see information on the aircraft available to purchase. Only aircraft currently on manufacturer price lists are available to purchase new. Once you have selected your aircraft, you can choose the number of aircraft to order and delivery location. The delivery location can be changed after purchase, and must be a location at which you have gates. Below that, you can choose how much of the price for the aircraft you would like to pay at the time of order, and how much upon delivery. If you are unable to pay the amount due upon delivery at the delivery time, your cash balance will go into the negatives, so keep your bank balance in mind when ordering aircraft. If purchasing aircraft is too expensive for you, you can lease them directly from the manufacturer. Your credit rating dictates the total value of aircraft leases you can have. When you go to lease an aircraft, pick the number of aircraft you’d like to order. The game does give bulk discounts starting at orders of 5. Keep in mind your credit rating - you may not be able to order as many planes as you’d like. Next, pick how long you’d like the aircraft, anywhere from one month to three years. If you pick a time less than three years, you can extend your lease afterwards. When you lease for a longer period of time, the manufacturer will give you a discount on the aircraft for keeping it for so long, so your monthly lease and down payment will be decreased. Next, pick your delivery location. Should you wish to change this later, the delivery location can be changed any time before delivery. The lead time shows how long it will take before your first aircraft is built, and the build times show how long each aircraft after that will take to be built. Finally, you will have to pay a down payment of the first week’s lease before you can order the aircraft. The first five leases you order after creating your airline will be delivered immediately. On the used aircraft market, you can find aircraft being sold by other players, and aircraft being sold by the broker. As an airline, when you go to sell an aircraft, you can choose to sell it to the broker for a low price, who will then mark it up and sell it on the market. This aircraft will maintain your seating configuration and registration when the next player purchases or leases it. It will also never disappear from the used market. Brokers also can randomly add aircraft onto the used market, which will be located at random airports around the world. Otherwise, you can choose to sell the aircraft on the market at your own price, just beware that players cannot lease this aircraft from you, they must purchase it, so keep in mind everyone else’s wallets if you want it to sell! When you go to buy an aircraft, you can click on the aircraft’s View Details icon in order to see the stats of the aircraft. Keep in mind that older aircraft are more expensive to operate. On the aircraft’s page, you can either purchase or lease any aircraft owned by the broker, otherwise if a player is selling them you can only purchase the aircraft. With leasing, keep in mind that the weekly lease of the aircraft plus your total current leases cannot add up to more than your credit rating, otherwise you will not be allowed to lease the aircraft. When the aircraft has been bought or leased, it will be wherever the broker or the last player left it. Therefore, be sure to ferry it over to your home base, otherwise your routes will not fly for that aircraft. Smaller aircraft, such as Q400s and Yak-42s, can take a while to ferry from place to place, so pick your aircraft carefully for its starting location! Every time you fly an aircraft, you encounter two major costs other than fuel. When an aircraft is on a flight, you can see sections of the costs of the flight labeled as “maintenance” and “insurance”. Maintenance costs are associated with aircraft age and cycles, older and more cycles means that the aircraft will cost you more per flight. This is why it is less expensive to operate newer aircraft, such as 737 MAXs, A320neos and the like, rather than DC-8s, 707s, and the like. Insurance is the cost to insure your aircraft in the event of something damaging the interior or exterior of the aircraft. Additionally each family of aircraft that you operate has a fixed weekly family maintenance cost, so it is cheaper to operate fewer families of aircraft. Routes are the backbone of the entire game; they are how you earn revenue and reputation and ultimately grow your airline. Before creating a route, be sure that you have researched flights you want to include on the route and have a good idea of what the demand is. For more on that, see the route research portion of this guide. The sections below will review how to set up and activate routes for your airline. Routes consist of a series of flights assigned to an aircraft. Think of a route as a daily schedule for a particular aircraft. Each aircraft can only be assigned to 1 active route at a time, with one exception (see next paragraph). You are free to create routes however you wish. Both hub and spoke and point to point style routing will work with Airline Enterprise. If you would like to do a simple return leg, for example LHR-JFK-LHR, you are free to do that. If you want to do something more complicated, such as LAX-SFO-DEN-ORD-DFW-LAX, you can do that as well. Routes do not have to start and end at the same location; you could do perhaps JFK-ORD-DFW-DEN-LAX, and then set up a second route with the same aircaft that departs out of LAX. As you can see, you can get fairly creative with your route configurations. The only rule is that routes with more than 2 stops can not exceed 48 hours in total accumulated flight time. You can define which days of the week a route will fly. This can be useful for maximizing utilization of your aircraft if it flies routes that are too lengthy to operate on a daily basis, or if you simply prefer an aircraft to fly different routes on different days. You can assign multiple routes to the same aircraft provided that they fly on different days and no two routes operate on the same day. Creating a route is a 3-step process. To create a route, go to Manage Airline --> Routes --> Create Route. The departure airport is the airport that the route will originate out of. In order to fly the route, whichever aircraft you assign to the route must be located at the departure airport. The departure time is the local time (at the departure airport) of the first leg of the route. The number of stops is just that, how many stops will the aircraft make during this route? This can be any number you like, keeping in mind the 24 hour rule. Keep in mind that flights departing or arriving between the hours of 1am and 5am will suffer some level of demand loss due to the extreme hours. Most passengers do not prefer to arrive or depart in the middle of the night. The amount of demand lost depends on what time the flight departs or arrives; a flight arriving at 1:10am will suffer very little demand loss, while a flight arriving at 3am will suffer almost maximum demand loss. The second step of the route creation process will have you configure the stops for the route, as well as select the aircraft that you want to fly the route. Only aircraft that are capable of flying the route you configured will be listed. If you want the route to fly uninterrupted, be sure the last stop matches the initial departure airport. Otherwise, you will need to create a second route to make the aircraft come full-circle back to where it started. The third and final step will have you configure the departure times of each flight in the route. Every stop will display a "Ready At" time. This is the earliest that the aircraft can depart from that location. If you change a departure time, be sure to consider how it affects the arrival and thus departure times of all following flights. When you save the route, the game will check it for errors and display the icon if there are timing errors. Eventually we hope to have the ready times update dynamically as you select the departure times, but for now that is not supported. If your route displays a "Gate Error!" message, this means you do not have a gate leased at either the departure or arrival airport (or both) for the affected leg(s). To clear this error, lease the required gates, and then save the route. Routes are flown automatically, in real-time. Once you create and activate a route, the game will automatically schedule your flights, assuming there are no issues with your route. If you deactivate a route, all currently scheduled flights will be completed, but will no longer be scheduled again in the future. To cancel scheduled flights, click the icon, once you have deactivated the route. On the routes dropdown, you’ll see a page listed as Active flights, you can also get to this from your airline overview page. This page shows all flights that are in the air, as well as all flights that are scheduled to be flown. You can see profits, load factors, and more. For more information, click on the flight number to see additional stats on your flight. In the Set Ticket Prices page of the routes menu, you can change your ticket prices for all flights you fly. Keep in mind the different variables - base price will have more of an impact on short-haul flights, and price per mile will have more of an impact on longer flights. Baggage fees will be added to your base prices in terms of the effect on demand. You can also change the cost of each individual flight in the Flight Numbers pages, where you can change prices based on flight number. When you are creating a route, you can choose to add a flight number to each leg of the trip. This will make it easier to change prices for each leg of a trip individually. You can also set the game to automatically assign you flight numbers by clicking About -> My Account, and turning on Auto Flight Numbers. Auto flight numbers adds flight numbers counting up from the previous highest flight number, or it will start at 1 if you do not have any flight numbers. If you do not assign flight numbers, the game will automatically assign a random flight number for each flight, which will change each time the flight operates. Quick flights are also assigned random numbers. In-Flight Service Configurations, or IFS Configurations, can be managed under the Manage Airline -> Routes -> Service Configurations page. IFS works alongside IFE to determine a reputation for each of your flights, and it directly affects your airline's class reputation. Giving your passengers a better product can be costly, but it will raise the reputation of your airline and allow you to charge higher prices. Similarly providing a poorer service is cheaper, but you will have to charge cheaper prices to avoid a loss of demand. IFS consists of 4 categories: Meals, Snacks, Beverages and Comfort. Each category is not equally weighted when it comes to determining the rating for your IFS profile, however. Meals are the most important factor, followed by beverages, then snacks, and finally comfort. Additionally, each class of passengers have different expectations when it comes to the quality of service they expect. Higher classes of service expect a better quality product. Offering peanuts on napkins may be okay for economy, but first class passengers will expect a little more. Longer flights require more meals in order to maximize your IFS rating. Flights under 5 hours in length do not require a meal to be served, however serving one will raise your IFS rating of course. Flights 5-10 hours in length require 1 meal in order to maximize your IFS rating, flights 10-15 hours in length require 2 meals, and flights more than 15 hours require 3 meals. Serving less meals than required will significantly lower your IFS rating. In addition to number of required meals, the flight length also affects the level of service (IFE + IFS) expected by all passengers on the flight. Passengers on shorter flights will not expect top-notch service, however passengers on a long haul flight will expect much more from your IFS and IFE offerings. This expectation is increased with each class of service, for example business class passengers will always expect better service than economy class passengers. You can only choose one option per class. Snack, Beverage and Comfort options and prices are inclusive of all previous options (+ Pretzels would include Peanuts and Pretzels, and the cost of serving both would be $60 fixed and $0.15 variable). Offering special/reserved meals is a good option for passengers that may have specific dietary requirements or allergies. Offering this service will increase your fixed and variable meal costs by 10% across the board. Fixed costs are one-time, per-flight costs of offering a particular meal or packaging. Fixed costs carry across all classes of service, so if you offer the same meal for all 4 classes, you will only pay 1 fixed cost. If you offer different meals in each class, you will pay the fixed cost for each meal you select, and the same goes for all other categories. Variable costs on the other hand are the recurring cost (per passenger, per flight, per meal) of offering a particular service. If you offer 2 meals, variable costs will double for meals, snacks, and beverages. If you offer 3 meals, variable costs will triple. Variable costs are per passenger served, not per passenger flown. Not all passengers may choose to take something off the IFS menu or use a comfort item offered to them, especially if you charge extra for those options. If you do not charge for the service, you can assume all passengers will use it. You can charge passengers to use your IFS profile. For meals, you can only offer 1 meal option per class, so the price you enter is the price of that particular meal/packaging combo. 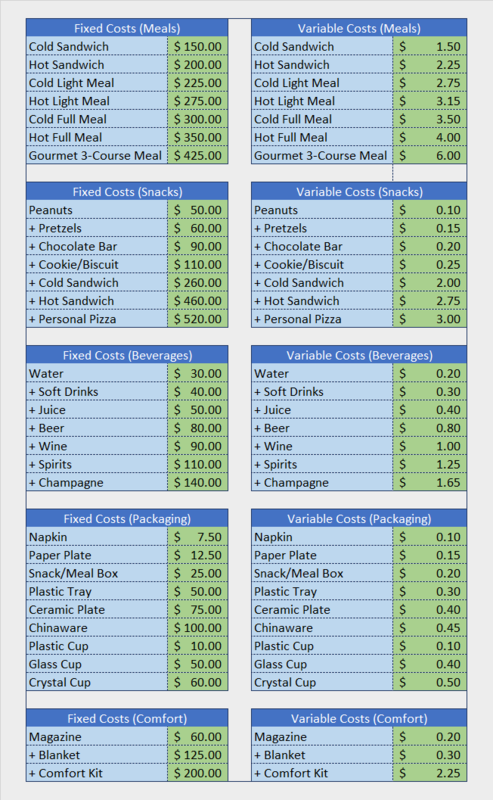 For snacks, beverages and comfort, the price you enter is assumed to be the average price of all the options you offer. As of right now Airline Enterprise does not support setting individual prices for each product. That may be supported at some point in the future. Higher classes of passengers are less sensitive to prices, so first class passengers are more likely to be willing to pay more for their IFS than economy passengers. For pricing it is essential to find the sweet spot where you make enough money to cover the cost of your IFS profile while not charging so much that nobody buys anything. In the Research Airlines page, you can see all the other airlines currently active in the game. Clicking on the airline name or logo will take you to an information page on the airline, where you can see a few stats on the airline. Clicking on the CEO’s name will bring direct you to a new personal message with that player. The research airports page allows you to view the different airports in the game, as well as information about them. Airports are ranked on a percentage scale, with 100% being the busiest, and 0% being the least busy. Busier airports have higher demand, but also have higher fees. To find a specific airport, enter its information at the top of the page. Should you not find a specific airport, we have instructions on the forums for how to add airports. The world map feature shows all the airports currently in the game, on a world map. Clicking on an airport will give you a short list of stats, if you want more information, click on the view details button. The research aircraft page shows all the aircraft currently in the game. You can click on a specific aircraft model for more information. The aircraft in this page are sorted into families, for which there is a charge for maintenance (a baseline charge for each family). Therefore, it is good to purchase/lease aircraft in the same family. The route research page is where you can check the demand of a route. On this page, you can see many different stats on the route. The demand bar on the right side of the page shows how much passenger demand is left for new entries on the route. If you plan on opening this route, check the route performance analysis section at the bottom of the page. The analysis evaluates the reputation, ticket price, and competiton of each class and compares it to your airline. The distance is important as well, as not all aircraft can fly all routes! Check your aircraft’s info page for its range, and compare with the distance of the route. If your ticket prices in any particular class are within 10% of either the base price or the average price of the class below it, a portion of demand from the lower class will migrate to the higher class (due to the low difference in expected ticket price vs actual ticket price, some passengers will choose to upgrade one class up). This migration effect is limited to no more than 50 passengers. The Distance calculator is a tool for finding routes within a certain distance range. Simply enter the origin airport, and the range you’d like to search for, and the game will pull up a list of airports for you. You can sort this list by whatever metric you like, such as passengers, distance, name, and more.